Ludurana Supernova Galaxia | Light Your Nails! Quick post today! This beauty is Ludurana Galaxia from the Supernova collection and it comes all the way from Brazil. Ludurana Galaxia should be a blue to purple duochrome with a strong linear holographic effect. To enhance the purple shade I layered it over TNS Rose Macarons but the blue shift is still dominant. I am on the fence with this polish because although I love duochromes and holos I find them together to be nonsense. Duochromes show their best shifts in low light, while holos needs to be in direct sunlight. Maybe I should focus on how you get the best of each finish depending where you are! Oggi post veloce :) Questo smalto è Ludurana Galaxia, dalla collezione Supernova, e arriva direttamente dal Brasile. Ludurana Galaxia è un duochrome che vira da blu a viola con un forte effetto olografico lineare. Per esaltare il cambio col viola l’ho steso sul TNS Rose Macarons ma il blu rimane il colore predominante. Sono sempre un po’ dubbiosa con i duochrome olografici. Io adoro i duochrome, e adoro gli holo, ma insieme? Mi sembra un controsenso perchè per far risaltare uno smalto olografico serve il sole, mentre i duochrome danno il meglio coi cambi colori quando la luce è bassa. Forse dovrei solo concentrarmi sull’avere il meglio dei due finish a seconda di dove mi trovo! What are your thoughts on duo or multichrome holos? Voi cosa ne pensate dei duo o multichrome con effetto olografico? Awaaaaaa ma quant'è bello! <3 Per fortuna questo ce l'ho anch'io, muahahahhahah! Thank you Flávia! Sorry I don't post comments that contain links. Sì, giusto un po' nella foto all'ombra ma ho faticato! 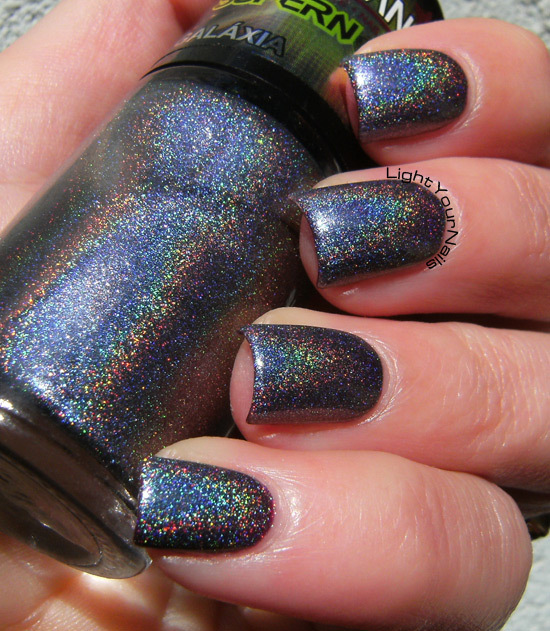 And I also like duochrome Holos, exspecially when it's a soft holo like Catrice Harlem's Holo Shake. Che spettacolo Simona!!! Bellissimo, davvero! Mi sa che in questo caso sono un po' controcorrente io! Sai cosa? Forse l'accoppiata rende meglio in quei multi/duochrome associati a particelle holo più rarefatte, tipo i vari ILNP Nostalgia, Cygnus Loop, Reminisce, etc. nella versione H.
The holo effect is strong and beautiful! Great polish! Io invece li amo entrambi! this is so pretty. I've only got one Ludurana, but it is just glorious. The fact the different finishes don't show up at the same time is actually a plus to me - this way the polish is interesting no matter the circumstances :)! I think that's the best way to look at it! I love both finishes so much especially when they're in one polish like this. Even if they don't show up at the same time ya know. It's just makes it really unique. I should look at it this way! Wow, that is stunning! I'm not a big fan of duo and multi chromes, so I'll only wear them if they have added holo. You'd definitely love the holo in this polish! LOVE Ludurana's holos! This is beautiful! Wow its like a galaxy mani in a bottle! I LOVE duo and multichromes but since I don't have a deep c curve, I feel like I can't get the shift as well but I still try to wear them!! This is a really pretty combo and I can appreciate the combo you were trying to put together! Oh that makes sense! I am quite lucky about the shift!